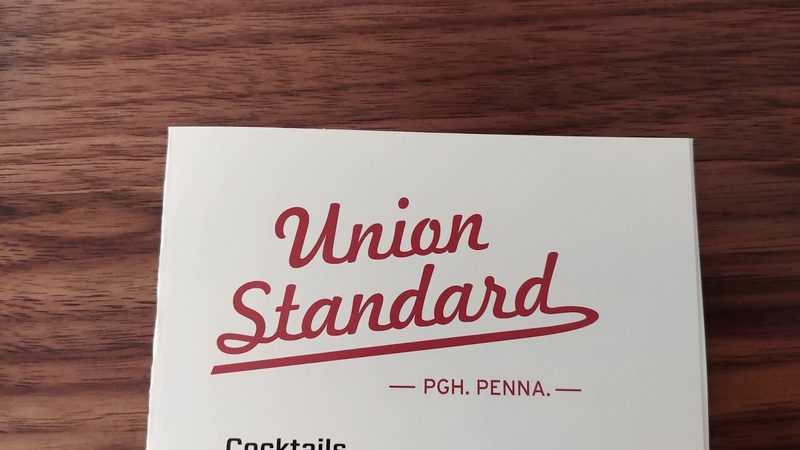 It has been a couple weeks since we dined at Union Standard. It's been open for over a year, but this was our first time there and it did not disappoint. We especially liked that there is an elevator to the second floor, which means we were able to sit there and not be restricted to the first level. Also, lots of natural light through the large windows. 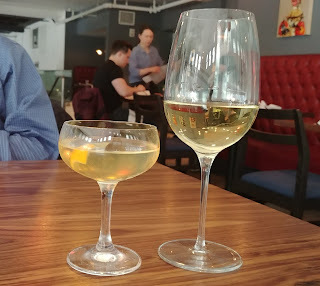 Drinks: Mellon Square Cocktail for him (gin, chamomile sabona, dolin blanc, orange bitters, cardamom tincture) and Folie a Deux Chardonnay, Russian River Valley, CA for me. To start: Warm Potato Bread (cultured butter, apple butter, goat butter). 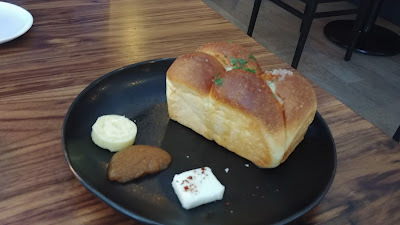 Oh my gosh this warm bread was delicious, especially with the 3 butters. We wiped the plate clean and wanted more. 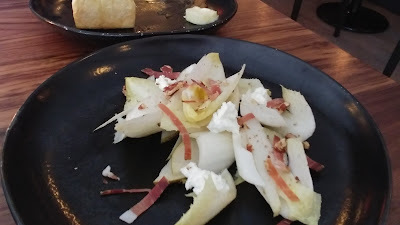 We shared a salad: Endive & Asian Pear (speck, smoked pecans, sherry vinaigrette, Goat Rodeo Chevre). This was different than the salads we usually order. I liked the salad even though I find endive just sort of meh. The other components are what made it yummy. 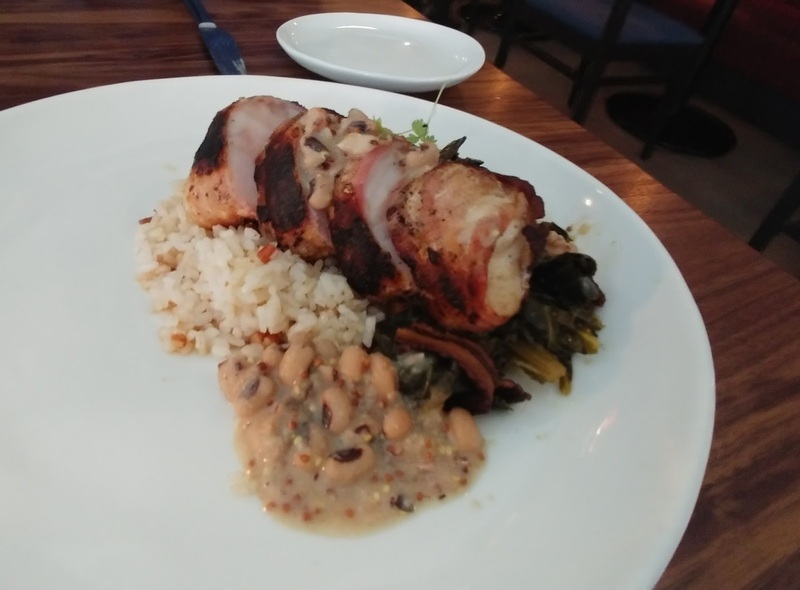 Entree for him: Bacon Wrapped Monkfish (Carolina Gold rice, toasted pecans, braised greens, black eyed pea vinaigrette). He said this fish was delicious and he ate everything on his plate. For me, Sea Scallops (ember roasted beets, cider glazed carrots, benne, lemon, granny smith apple, celery). My scallops were delicious. 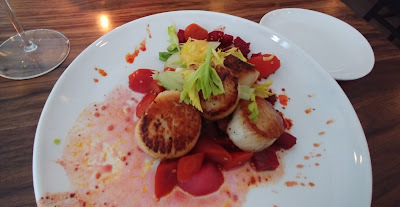 I was a little full from the bread and salad and I wanted dessert, so I couldn't/didn't eat many of the carrots/beets (beets not being a food I really enjoy) but I did eat all the scallops, lemon, and apple. It was a very pretty dish in person although my photo makes it looks a little bit like a crime scene of red-pink splatter. Trust me, it was beautiful in person. 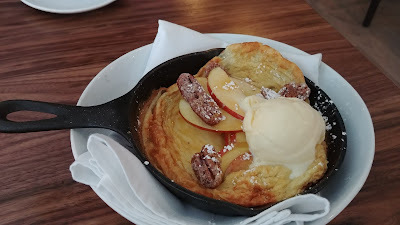 Shared dessert: Vanilla Dutch Baby (lemon ice cream, apples, candied pecans, honey). Really good. We quickly devoured it, scraping the pan clean. We both enjoyed our food. 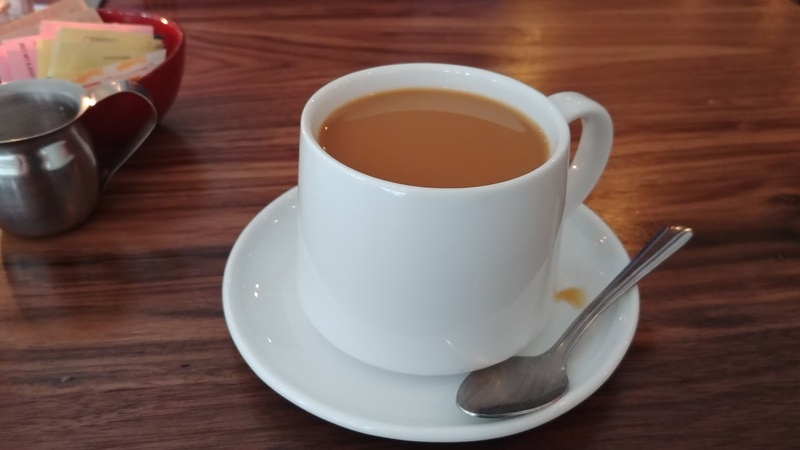 Service was good. I felt bad when I asked for specifics on the lamb dish because as soon as our server went to check, I remembered that we were having lamb the next day and then leftover lamb for several days during the week, so I knew I wouldn't end up ordering it. Oops. We'll be back - especially for that potato bread and Dutch baby.